Garage doors contribute to the overall look of many houses. 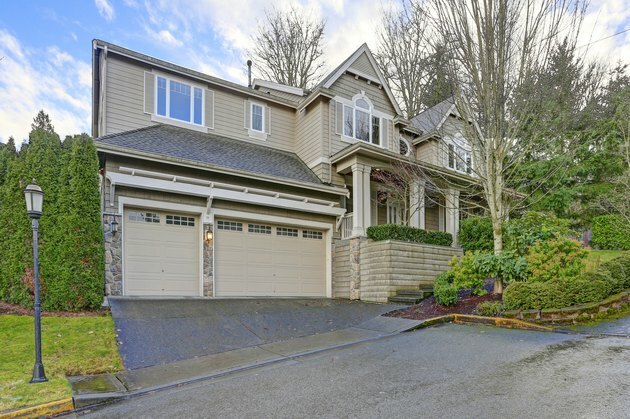 Aside from the front facade of your home, the garage door may be the most visible part of your house from the street. Even if it isn't, the garage door is certainly one of the most used, as it is opened and closed hundreds of times a year. And that workout means the doors require a certain level of routine maintenance to keep them looking good and operating effectively. A well-maintained door can help keep the garage door opener in good condition, as well. It is a good idea to review the manual that came with the door and the door opener. If you don't have them, you may be able to find them online. The manual will point out cables and springs that are under high tension and should not be adjusted by anyone but a trained garage door technician. And the manual should indicate the routine maintenance that owners should practice. Here are some maintenance tasks you can perform. As far as a schedule is concerned, plan on checking the door opener safety features and testing the door's balance at least a few times a year; some manufacturers recommend a monthly check. Lubricating hinges and the like is an annual job. Periodically inspect your door visually to see how it is how it is holding up. Wooden doors with peeling paint should be sanded to remove the damaged paint, then repainted. Sand and prime rusted areas on metal doors and repaint. Inspect the working parts of the door from the inside. Look for anything that seems not quite right, such as cables that are frayed, or springs, pulleys, and rollers that look damaged. These could be early signs of budding problems that might later need professional attention. You can tighten any loose bolts you find with a socket wrench, but don't touch anything that is painted red or has a warning tag attached to it. Those fasteners could be attached to a component that is under high tension. Consult a qualified garage door technician if any of these parts need attention. Check the weather-stripping on the bottom of the door. Inspect it when the door is raised and again when it is closed. If the weather-stripping is brittle and there are gaps in it, or if it is missing altogether, have it replaced. This is a job most homeowners can do themselves. Remove leaves and other debris that accumulate in the tracks of the door. Many people apply grease to the tracks, but it is not necessary. The grease does not help the door work better, and dirt and debris will attach itself to the grease. Be sure to tighten any loose bolts or nuts. A properly balanced door will not slide up or down on its own. An unbalanced door can be dangerous and it can put stress on the garage door opener. Test it by first disconnecting the power from the door opener, and disconnecting the door from the opener mechanism. Raise the door manually to about waist level and let go. A door that is in balance will not continue to move upward or fall back to the floor. One that does keep moving needs to have its springs adjusted by a garage door technician. Garage door openers manufactured within the last 25 years must have an automatic reversing mechanism and photoelectric sensors. To make sure the auto-reverse is working, open the door. Place a small object, such as a wood 2 x 4, on the door's threshold. Close the door using the remote or the wall switch. When the door hits the object, the door should reverse and open fully. If it does not, call a professional, or refer to your owners manual for advice on how to adjust the door. There should be a sensor mounted near the bottom of each track. They are linked to one another by an invisible beam. When something breaks the beam, the door will not close. Close the door using the remote or wall switch and wave a broom between the two beams. The door should reverse course. If it does not, try cleaning off the sensors' lenses. They are located in a garage near the floor, so they tend to get dirty. If there is still a problem, the sensors may be out of alignment. The manual should provide instructions on aligning them properly. As a last recourse, you can call a technician. Unless the door or door opener manufacturer says otherwise, white lithium grease is a good lubricant for hinges and rollers. Don't lubricate nylon rollers. Some people lubricate the door's springs, but most manufacturers take care of this at the factory, and this lubrication should last as long as the door does. To be sure, check the manual for recommendations. About once a year, lubricate the hinges and rollers. But always keep the tracks clear of debris. 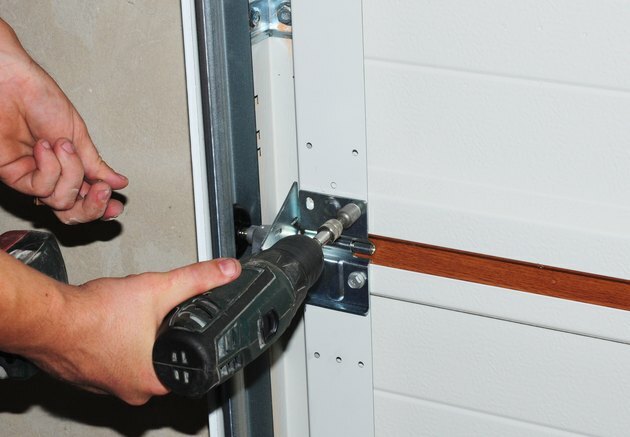 As with the door, make sure all nuts and bolts on the garage door opener are securely attached. Check the manual—some chain and screw drives need to be lubricated about once a year. And it is a good idea to change the batteries in the unit on a regular schedule. Check the chain in chain-drive openers. Sometimes they begin to sag after repeated use. If the chain sags about 1/2 inch below the rail, it should be tightened or it could damage the motor. And if the chain sags that much, it is probably very noisy during operation and will be quieter after tightening the chain. Disconnect the electric power and use the manual override to disconnect the opener from the door. Look for a turnbuckle with two nuts that connects the ends of the chain. One nut is a locknut and washer and the other relieves or tightens the tension in the chain. Loosen the locknut, and adjust the tension on the chain with the other nut. Tighten the locknut. The chain should ride about 1/4 to 1/2 inch above the bottom of the rail. Going through this simple inspection and maintenance routine annually, and you'll prevent most serious problems requiring a technician. Garage doors don't require much maintenance, but if you attend to a few details the door and the opener will last for years.